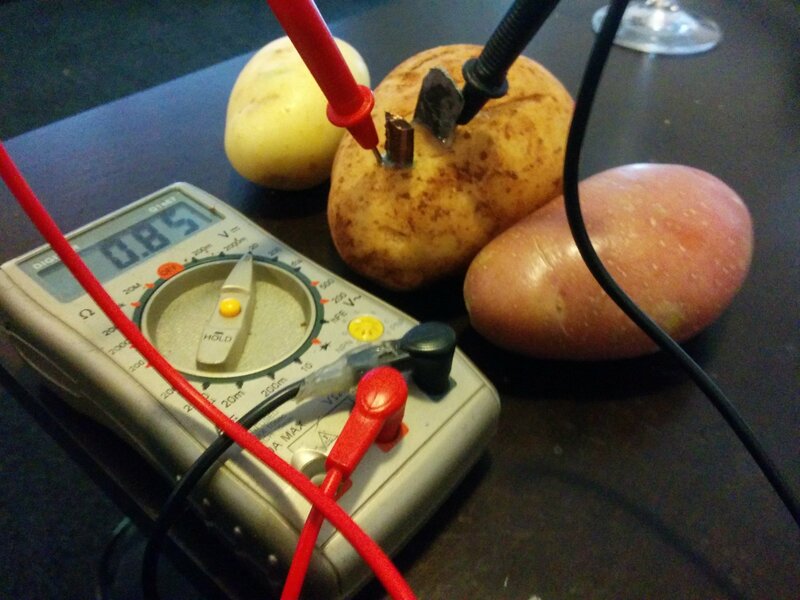 My 3d Printer is back online and printing reliably, so I had some spare time today while waiting for prints and decided to have a play with the potato battery (which I’ll need for the Potato Pie) in a practical sense. I’ve discovered the hardware store near my house and decided to head on down there to see if I could get some copper and zinc in an easier to process form. Currently I’m working with copper bar and zinc ingot. Which basically means having to cut every wafer manually. Galvanised and copper sheeting (not sure about the copper sheeting) would be a nice substitute for manual labour. 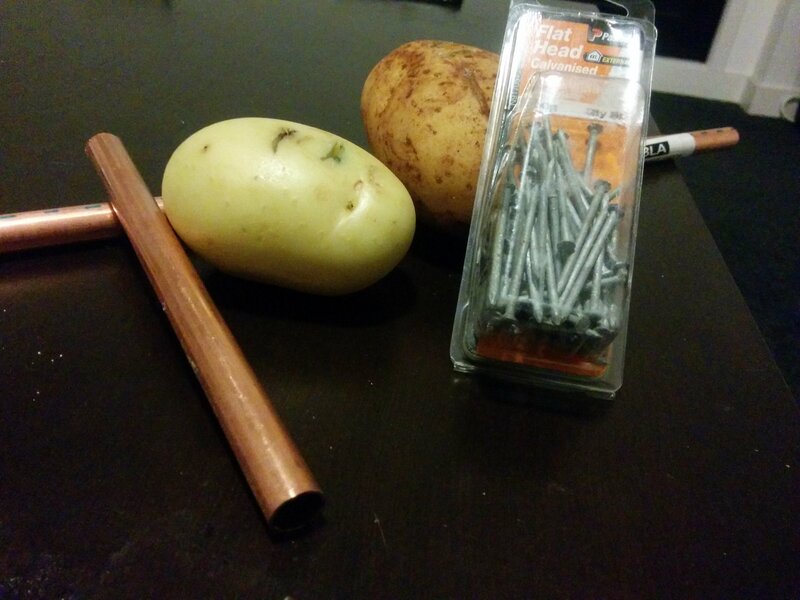 Unfortunately I didn’t get a win on copper sheeting, but in browsing I stumbled onto some copper pipe which would go perfectly with galvanised nails.m So I went ahead and hit the grocery store for some spuds to start a trial. 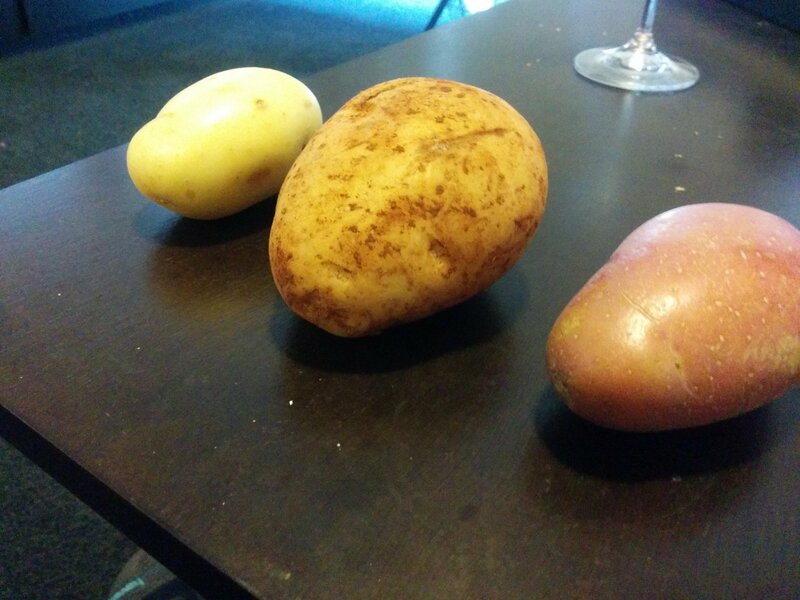 One of each type (left out the sweet potato though) and gave them each a bloody probing. A nice score from the one I used last time in testing, as you can see above. Maybe the others would surprise me. A slight improvement from this dirty looking one. (I refuse to acknowledge I know their names dammit!) But nothing overwhelming. 90! We have a winner. Ok, that’s not spectacular but I’ll take what I can get. I’ll take a moment here to mention that I know I haven’t checked the current yet, but I’ll cover it in the next post. Let’s just say I’m trying to squeeze as many cells as possible out of every potato because it’s disappointingly pathetic current. 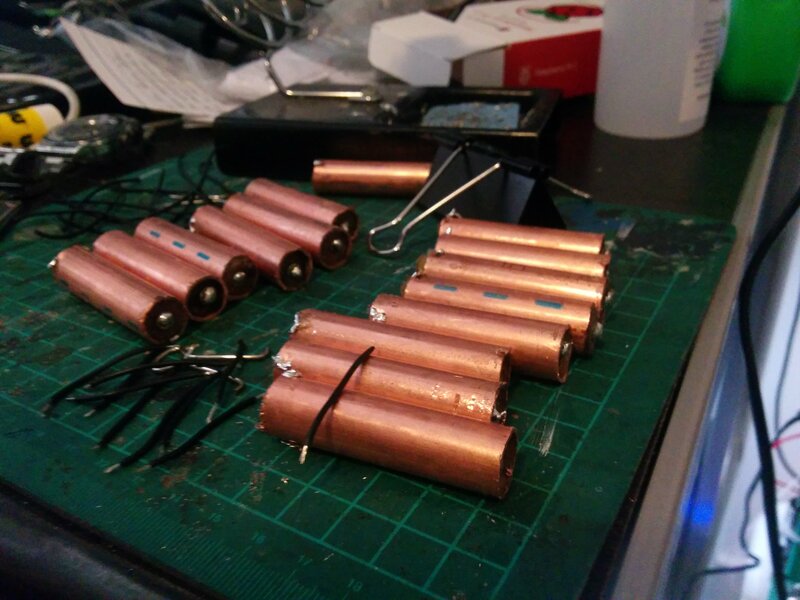 With my ingredients gathered, I cut the copper piping into small nail length sections in preparation for the assembly. It’s simple really. Use the copper piping to punch a hole in the potato taking the extracted starchy goodness with it. Then just bang the nail in nice and centered. If you touch the copper with the nail it’ll just short out and give you nothing. Tada! Bloody convenient if you ask me. One quick check to make sure I didn’t screw it up and it looks good. But I’m gonna need a few of them, so an hour later I’ve got these bad boys ready to roll. Looking oddly familiar aren’t they 😛 Now I have to solder some wires onto each of these suckers if I’m going to link them up. Soldering onto dirty copper or most types of galvanising is a suckers game, so I just hit them with the file on the nail and lower part of the copper tubing to ensure good contact. Starting to look familiar, let’s put some wiring on them. I know I’m going to need a little over 5 volts to operate the raspberry pi, so I’m wiring them up in 2 sets of cells in series. Converting is a lossy process and I need all the juice I can get. So this gives me the voltage I need and doubles the current. I got 6 volts out of these 8 cells, but I’m happy to stick with that for now as some of the cells can be a little shoddy and I may need that little bit more to compensate for loss later. Now I can wire the whole lot up in series if I want to, which I did for a giggle. 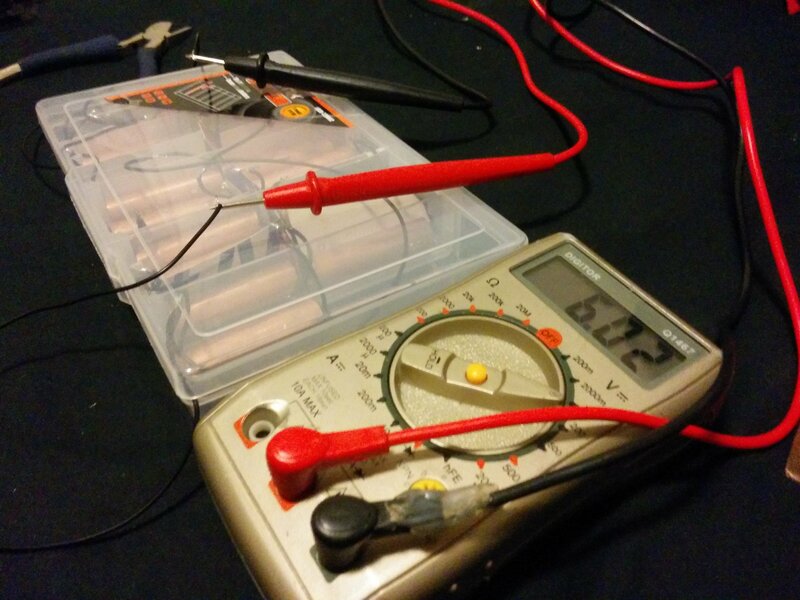 Could continue stacking these if higher voltage needed. But like I said, I don’t need 12 volts and the conversion back to the 5 or so needed is a waste of effort and power. So I just went with the 6volt. Close the box up and confirm we’re still good to go. 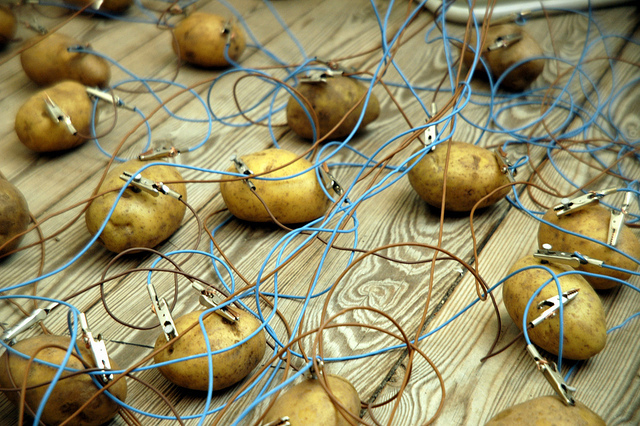 Running the both of the 6 Volt stacks of potato cells in parallel gives me my 6 volts and a little more current. 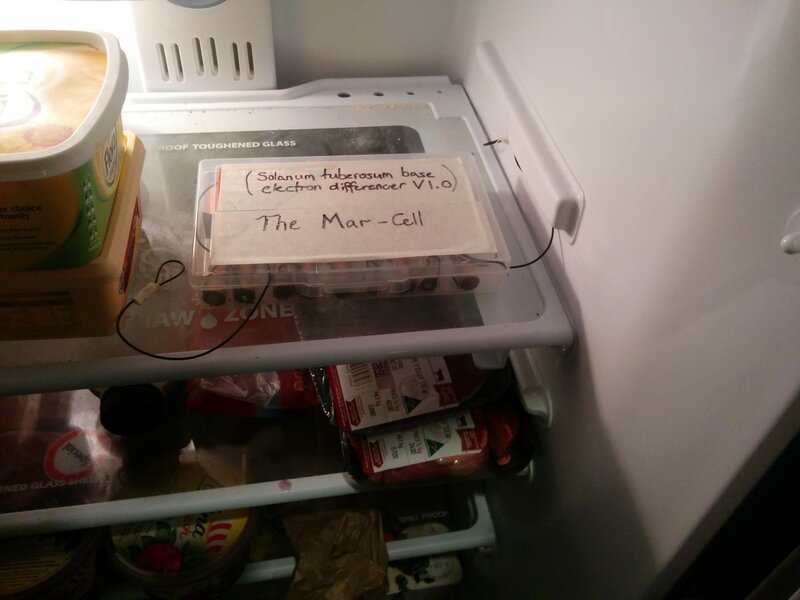 I figured it looked too dodgy in that clear plastic box like that, so I decided to add a label to snazzy it up a bit. I will never apologise for naming it that. There! I don’t know if that’s the right thing or wrong thing. 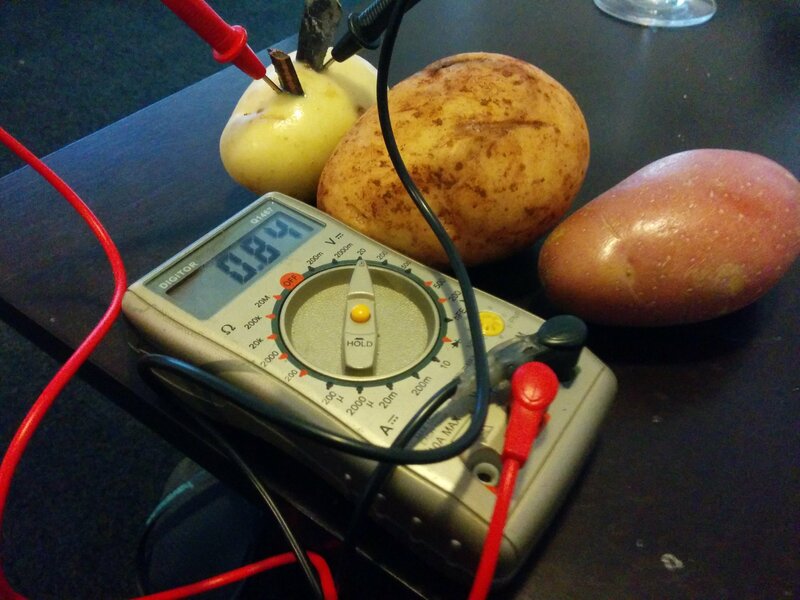 Who the hell knows what to do to look after a thing that’s half food, half power source? Anyway, I have left overs to try a few different designs. Now I just have to see if I can come up with something that takes less space, labour, and is more cost effective. GNIGHT! Previous post Innovation Means Trying Something New, Not Copying. Oh wait somehow some image loads. You know I really wanted to incorporate graphene somehow, but realized I don’t own a blender anymore. Gold and silver would be nice, but unless I could get away with gold leaf, it might be a little expensive. Hmm. Not sure why its done that. Will double check from work. Very interesting and quite funny writing! Will keep an eye on this to see what kind of power do you get in the end with the other designs. Thanks Nixie, I’m kind of new to blogging so I’m glad I didn’t miss the mark horribly. I’ll be sure to include the complete measurements in my next one. More than a small part of me would like to see a potato arc. I just hope the resources required to do it (e.g. the copper) isn’t cost prohibitive. Fingers crossed. What’s the length and diameter of the copper tubing? Haha! The tough questions 🙂 I don’t know off the top of my head because I didn’t have much of a choice. I’m finishing up at work in about 3 hours and can give you details. If you’re looking for an estimate in the mean time, the copper tubing diameter was a little shy of the diameter of a quarter (yes I’m an Australian who carries a quarter around for situations just like this). I should mention that the galvanized nail seems to be where I was deficient. 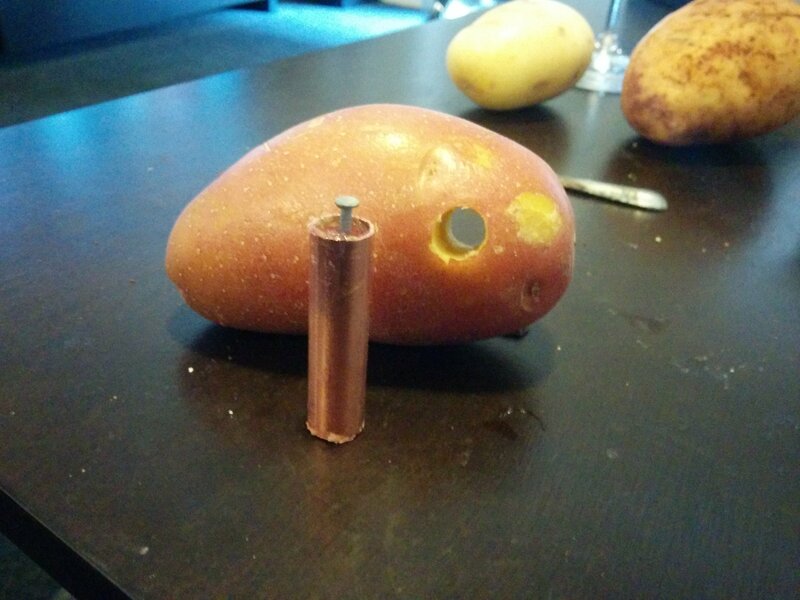 There was a lot more surface area of the copper contacting the potato than there was of the galvanized nail. 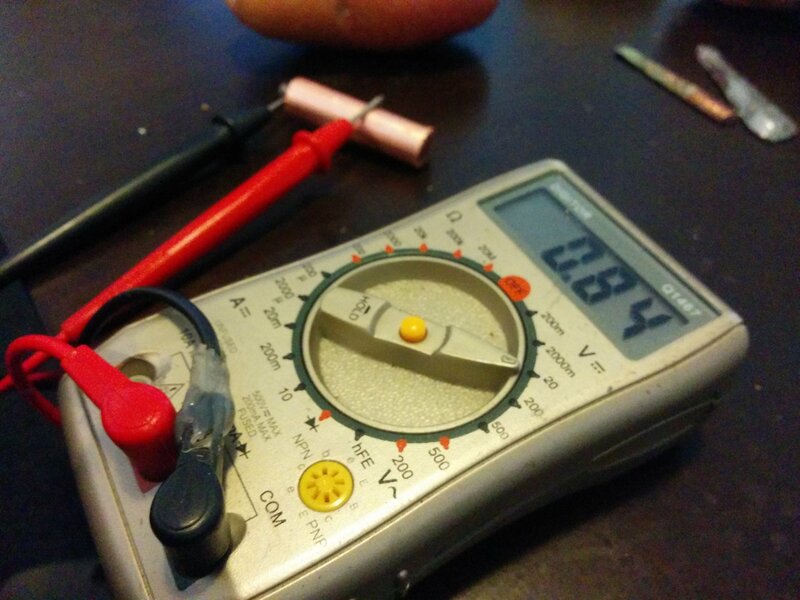 There was a noticeable difference in voltage when I just pushed the nail in a little further. 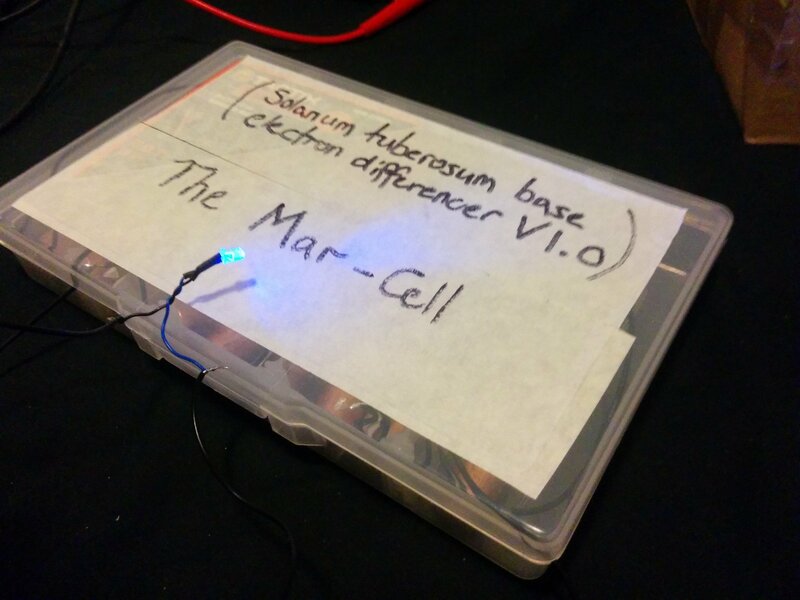 If you’re considering making something like this for practical purposes, I would warn you that the voltage looks good, but the current is disappointing. 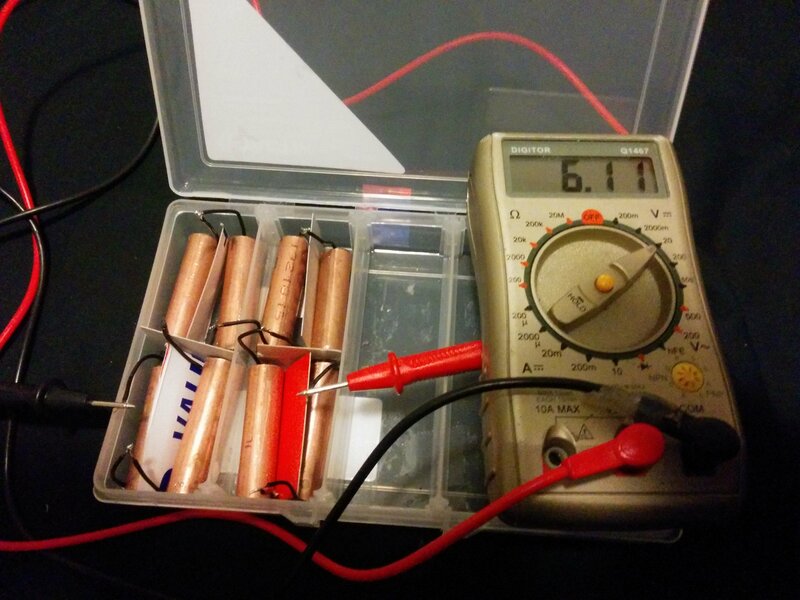 I mean, I’m still going to go for gold and get a usable power supply out of it, but I’m not quite there yet. I’ve got a few more designs I want to try tonight and until I have results back from them I don’t want to lock anything down. I’m aiming for a total of 2.5 watts minimum. I like it! 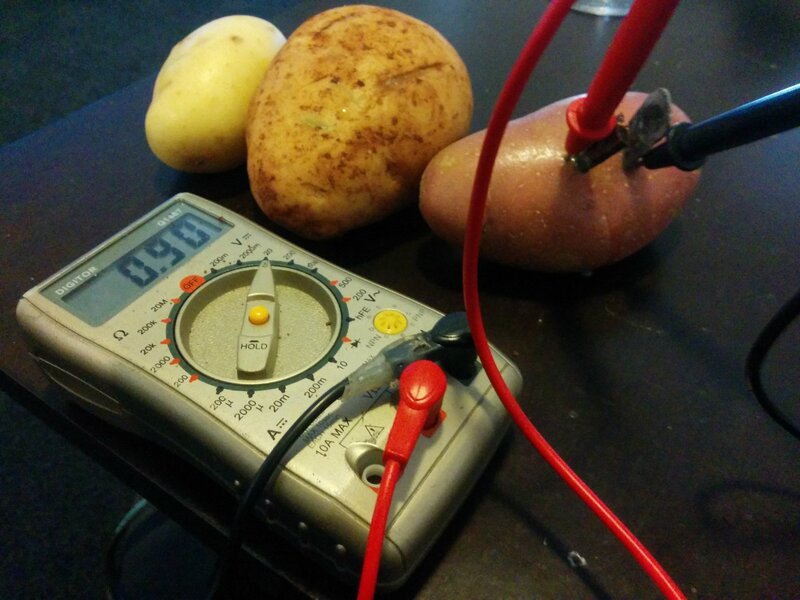 I’ve always wanted to try slicing the potatoes with a mandolin slicer and cut some steel and copper flashing into discs and see what kind of voltage you can get from that. Funny, that was my plan originally. I don’t have a mandolin slicer but I have a 3d printer. So I was going to print out a similar cutting tool then use copper plate and roof siding (which is galvanised i.e. 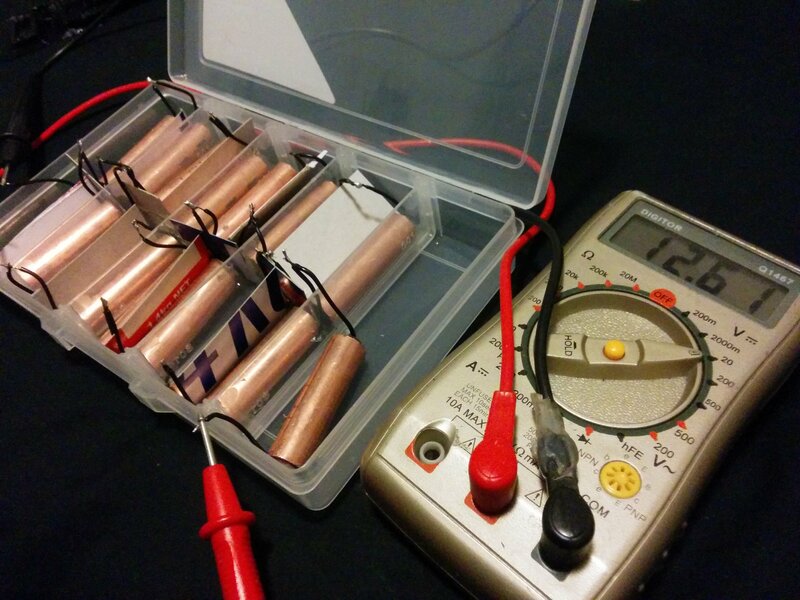 has zinc) then stack those wafers on top of each other like a voltaic pile. I even revised that and was going to use PCB because the copper is laminated onto plastic with provides insulation for each wafer. It’s purely the lack of appropriate stock at a reasonable price that sent me looking for something better until I stumbled onto the piping. I thought it was kind of cool how it ended up looking like a battery in the end. That’s a fair request. I didn’t include it in this first iteration as my focus has been on getting the potato mass to voltage ratio to the most favourable level I could. I’ll try to get the remaining measurements and reply here if I get time tonight, otherwise I’ll include it in the next post.